Ah, winter camping! Some scouts love it, others don’t. I believe it can be a lot of fun when you are dressed right and have the proper gear. Imagine doing a 10-mile hike in flip-flops… Would you be interested in hiking again if all your memories were about those sore feet? Of course not! It’s no different here with winter camping. With the right preparations, it could be a good experience and one that is valuable for the boys to learn from. Here’s a list of tips that was presented at my district’s Roundtable this month. Hope it helps with planning your next cold weather outing or Klondike Derby. Always bring a bit more than what you’ll need – water, food, clothes. Bring extra WATER. It’s easy to get dehydrated in the winter. You aren’t visibly sweating, so you don’t think to drink water, but since the air is so dry, you will lose a LOT of water through breathing. Drink lots of water! Clean – dirty clothes lose their loft and get you cold. Overheat – never get sweaty, strip off layers to stay warm but not too hot. Layers – dress in synthetic layers for easy temperature control. COTTON KILLS! Do not wear cotton. Remember the 3 W’s of layering – Wicking (inside layer), Warmth (middle layers), Wind/Water (outer layers). The wicking layer should be a polypropylene material that is worn as long underwear and sock liners. Warmth layer(s) should be fleece or wool. The Wind/Water layer should be Gore-Tex or at least 60/40 nylon. 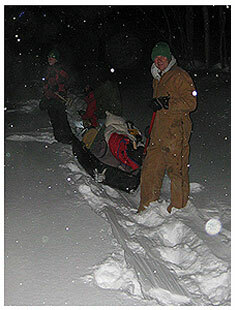 If you’re camping in the snow, wear snow pants over your regular clothing. Bring extra hand covering – mittens are warmer than gloves. Keep your hands and feet warm. If your hands and feet are cold, put on more layers and put on a hat! Dress right while sleeping. Change into clean, dry clothes before bed. Wearing wool socks and long underwear (tops and bottoms) in the sleeping bag is OK. Put on tomorrow’s t-shirt and underwear at bedtime. That way you won’t be starting with everything cold next to your skin in the morning. Wear a stocking cap to bed, even if you have a mummy bag. 40% of your body heat is lost from your head. Put tomorrow’s clothes in your bag with you. Use a couple of long-lasting hand warmers and sleep with one between your legs (warms the femoral artery) and one at your feet – neither directly on your skin. Use a sleeping bag that is appropriate for the conditions. Two +20F sleeping bags, one inside the other, will work to lower the rating of both bags and keep you warm. Use a bivy sack to wrap around your sleeping bag. You can make a cheap version of this by getting an inexpensive fleece sleeping bag. It isn’t much more than a blanket with a zipper but it helps lower the rating by as much as 10 degrees. Use a sleeping bag liner or blanket. There are silk and fleece liners that go inside the sleeping bag. They will lower your sleeping bags rating by up to 10 degrees. Don’t sleep directly on the ground. Get a closed-cell foam pad to provide insulation between your sleeping bag and the ground. A foam pad cushions and insulates. In an emergency, cardboard makes a great insulator. Old newspapers also work as good insulation. A layer of foam insulation works too. Bring a piece of cardboard to stand on when changing clothes. If in tents, leave the tent flap/zipper vented a bit, it cuts down on interior frost. Here’s a printer-friendly version of these Winter Camping Tips if you would like to use this for your own troop. 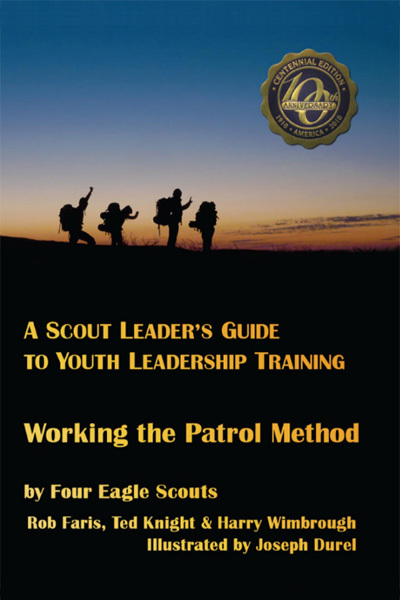 This entry was posted in Camping, Scout Outings and tagged boy scouts, closed-cell foam, cold weather, fleece, klondike derby, polypropylene, scout outing, winter camping, wool. Bookmark the permalink.